The Viper is the standard workhorse fighter craft of the Colonial Fleet. This single-pilot craft features a distinctive tri-fin design and is equipped with two forward-mounted laser-torpedo guns as well as a unique turbo-boost feature. While primarily designed for long-range space flight, the Viper is also capable of atmospheric flight. This model kit is a faithful recreation of the fighter craft as seen in the original Battlestar Galactica TV series. Released to commemorate the 35th Anniversary of the original TV series, this version includes a Ralph McQuarrie art print. 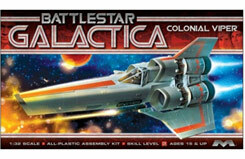 • This plastic model kit of an original series Colonial Viper requires paint and glue to complete. • Released to commemorate the 35th Anniversary of the original series.